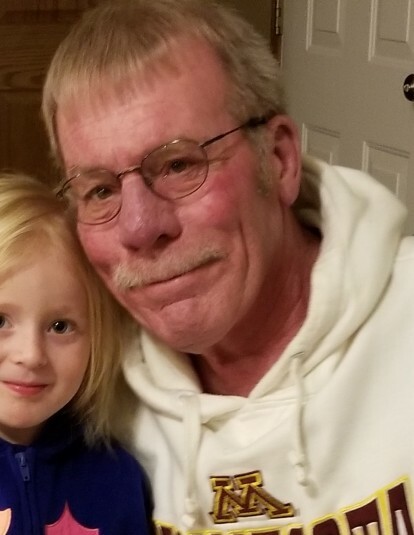 Joey Lee Salveson, age 67 of Wyoming, Minnesota; formerly of Vergas, Minnesota died Sunday, November 18, 2018. Joey was born, June 23, 1951 in Crookston, Minnesota, the son of Boyd and Shirley (Bratager) Salveson. He graduated from Winger-MC High School, Class of 1969. He was united in marriage to Lynnae Hedman on October 30, 1976. Joey and Lynnae were blessed with two beautiful daughters, Amy and Jill. These girls were his pride and joy. Joey retired after many years of service from Becker County in 2011. He loved dancing, hunting and fishing. Joey will be forever remembered for his generous spirit and big heart. He was always willing to lend a helping hand to anyone in need. His playful and sometimes “goofy” personality could bring a smile to anyone’s day. Above all, he loved his family, especially his three grandchildren and will be deeply missed by all who were blessed to know him. He is preceded in death by his father, Boyd; niece, Michelle Trandem; brother-in-law, David Neumann; beloved aunts and uncles. He is survived by his daughters, Amy (Scott Como) Salveson, Jill (Cody) Hammer; grandchildren, Jenna Como, Lindsey Como, Briar Hammer; former wife, Lynnae Salveson; mother, Shirley Salveson; siblings, Tim (Brenda) Salveson, Karen (Kent) Jacobson, Marie Bunday; nieces, nephews, family and friends.